Ian Keatley kicked 11 points as Munster edged a 16-12 victory over Zebre in the Pro12 in Parma. Mark Chisholm's early try helped Munster take a 7-0 lead but three Kelly Haimona penalties nudged Zebre ahead by the 20th minutes. Two Keatley penalties gave Munster a 13-12 lead at the interval, with Tomas O'Leary making a vital intervention to prevent a Johan Meyer try for Zebre. Keatley's drop goal was the only second-half score as Munster held on. Despite their win, Munster drop one spot to sixth in the table after the weekend action after Ulster moved into fifth thanks to their bonus-point victory over Treviso. Chisholm's fifth-minute try was awarded after the referee consulted the TMO to see whether the Australian lock had lost control of the ball before grounds. Keatley added the conversion to increase Munster's lead but indiscipline from the visitors allowed Italy fly-half Haimona to kick Zebre into a 9-7 advantage by the 20th minute. Further Keatley and Haimona penalties saw the sides swap the lead before the Munster fly-half's third successful kick left the Irish province 13-12 ahead at the interval. Haimona missed his first penalty of the afternoon when Munster were penalised for not rolling away from the tackle early in the second half. 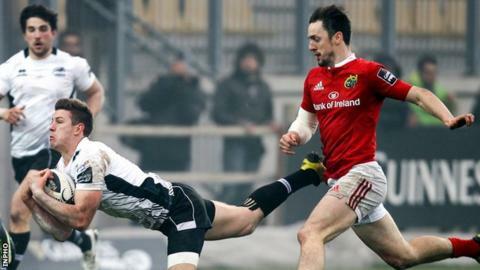 Keatley spurned a penalty opportunity of his own before landing a 71st-minute drop-goal which stretched the Munster lead to four points, and Zebre could find no way back from that. Zebre: K Van Zyl; D Berryman, T Boni, M Pratichetti, M Visentin; K Haimona, L Burgess; A De Marchi, O Fabiani, P Ceccarelli; G Koegelenberg, M Bortolami; E Caffini, J Meyer, J Cook. Replacements: E Coria for Berryman 42, B Postiglioni for De Marchi 41, G Roan for Ceccarelli, F Ruzza for Koegelenberg, F Cristiano for Caffini, G Toniolatti for Van Zyl 73, M Muliaina for Visentin 48, U Beyers for Boni 73. Munster: A Conway; D Sweetnam, F Saili, R Scannell, R O'Mahony; I Keatley, T O'Leary; J Cronin, N Scannell, J Ryan; D Foley, M Chisholm; B Holland (capt), J O'Donoghue, R Copeland. Replacements: M Sherry for N Scannell 59, D Kilcoyne for Cronin 59, M Sagario for Ryan 66, Dave O'Callaghan for O'Donoghue 40, S Buckley for Foley 71, D Williams for O'Leary 49, G van den Heever for O'Mahony 74.